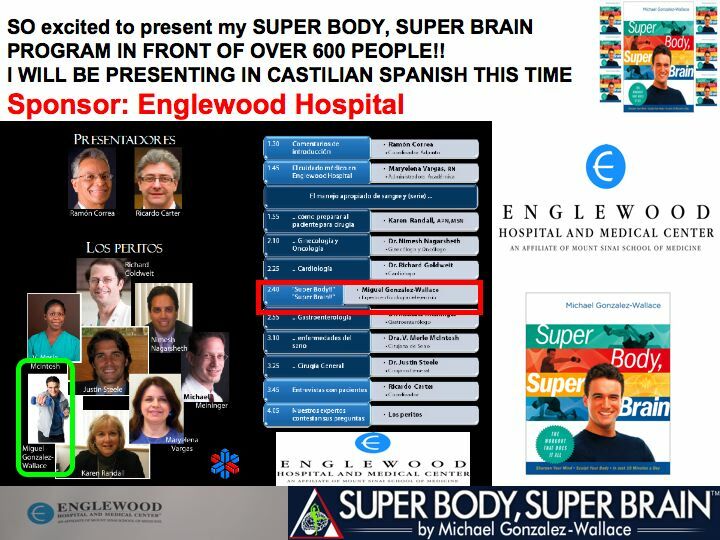 Englewood Hospital-Medical Conference: So excited to present my SUPER BODY, SUPER BRAIN in front of over 600 people! Hi followers! I am so excited with this great event. This will be the first time that I will be presenting my program in front of almost 600 people! Wow! Such a great honor to be part of this event, with phenomenal doctors,Medical Doctos and PhD’s but also so thankful that Englewood Hospital loves my program and my book. I will start explaining the philosophy behind my fitness program, my research, the collaboration I had with top neuroscientists in the country and we will finalize with a great 5 minute Super Body, Super Brain workout. If you have any questions please let me know and I will make sure that I will upload my presentation here. The event will be in Spanish. SUPER BODY, SUPER BRAIN AT ENGLEWOOD HOSPITAL: FOR EMPLOYEES AND EVERYONE ELSE!